Get into the Halloween Fun with Crafts! I love crafts that we can do together. My kids like to make a mess and I like to let them. Last Saturday we spent a few hours of down time crafting. It was really fun to let the kids get creative with bright colors. 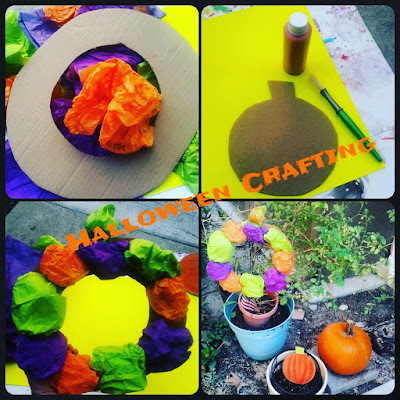 Here is a step by step to make a colorful pumpkin wreath and a mini pumpkin! * Cut your shapes from cardboard, we used an old water bottle case box. * We used the cut out from the circle used for the pumpkin as a mini pumpkin. * Scrunch tissue paper, the color of your choice and stick with glue or double sided tape like we did. * Paint your second craft - the pumpkin. After it dries a bit then add the layered curved lines in with more coats of paint to give the pumpkin look to it. 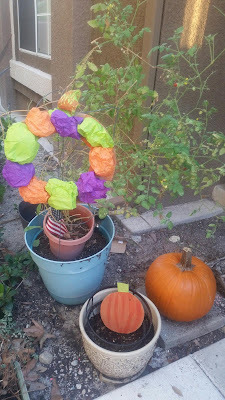 * add any accessories to your crafts - we added tissue paper to the tops of both pumpkin wreath and mini so that the stem was more vibrant & stands out. We got the tissue paper our of our bag of gift bags and tissue paper stash and we used tempra paints that my kids paint with. We taped a little piece of string to the back and looped it so that it would hang. If you craft up some fall fun I would love to see it. 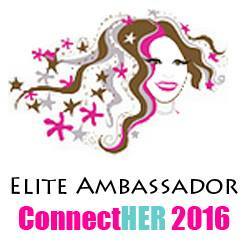 Please share on my FB or comments below.